Today the family went to visit the USS Arizona Memorial which involves getting up early to be in Pearl Harbor by 7a to collect four of the 1,300 free tickets they hand out. Obama and the Japanese prime minister were to make a joint appearance at the memorial the following day, the first ever visit by a high-ranking japanese official. For security purposes, the historic meeting would mean closing the memorial to the public, which in turn meant heavier traffic today and the day after the closed meeting. Or so we figured. Whether the line was longer than usual we'll probably never know, but there must have been close to 1,000 people already in line when we arrived. We spent probably an hour getting in various lines to eventually get tickets for 1:45p, not bad we thought, considering. Having two vehicles, we decided to split up and come back around 1p. Mom and Ryan wanted to visit Wakiki while Jackie and I opted for a hiking agenda. I had some fairly short ones in mind that I thought she might enjoy. She did, and we both called the day a success. This is the modest highpoint above Lahilahi Point on the west side of the island in Makaha. It's a small spit of land with tricky access which is probably why you won't find much online about it. Too bad, really, because it was a pretty nice little scramble. We parked on Farrington Hwy to the east, crossing the beach and following the coast to the point. One of the neighbors has erected No Trespassing signs outside his property and annexed a bit of land to keep people from crossing in front of his own. We climbed along the rock wall beneath it to get access to Mauna Lahilahi's East Ridge. I briefly walked along the bottom edge to look at the south side but noted a homeless encampment on that side. We turned right instead, and headed up the East Ridge, following a use trail up through some cliffs that look harder than they really are. A very short class 3 traverse was the crux, nothing difficult. THe lava rock turned out to be quite solid with great holds that made for fun scrambling. It took only 15min to reach the top. Two ladies that we'd seen heading up when we started out, were sitting on the small summit. They asked if we'd found an easier route than their own which they didn't seem to like too much. I commented that I'd be happy to show them the way we went if they like, but never actually got the chance. We continued over the summit, initially just planning to find a perch a little lower to the west. But we got interested in this more exposed route and sort of just kept going along it. The ridge got steeper and eventually finished with a 15-foot vertical wall. This last bit took some work, slow work at that, checking each placement while making our way down. Jackie handled it as calm as I've seen her, even with Dad being a little nervous. Once down, we walked around the north side of the feature to reach the beach on that side. There are two resorts here, The Hawaiian Princess and the Makaha Beach Cabanas that have locked access gates on both the beach and street sides of the resorts. We found a narrow public beach access walkway between the two, unsigned and almost invisible from the street. We had actually driven right past it earlier without noticing it. And even if we had, the street is signed for No Parking so it's not altogether convenient, but it does make for an easier access to Mauna Lahilahi than the beach route we took initially. Another five minutes walking along the highway saw us back to our Jeep about 50min after we'd left it. Great fun, this one. 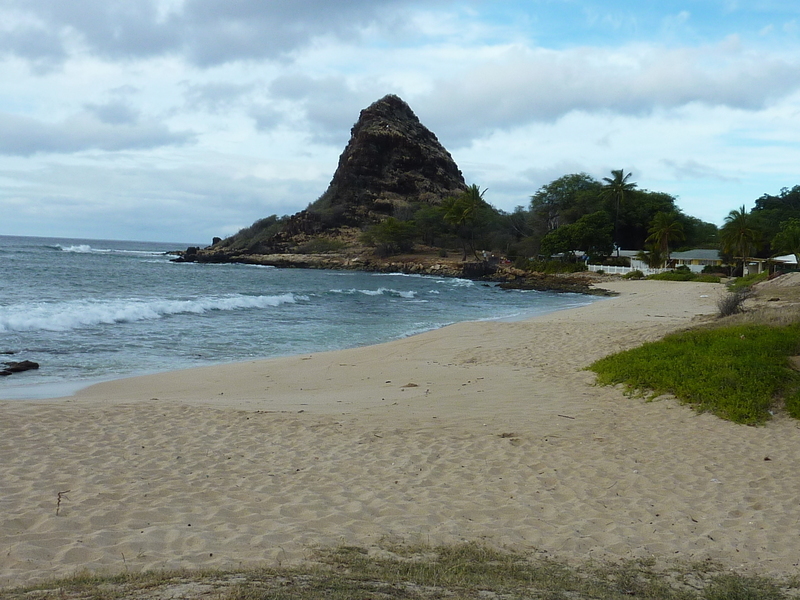 We drove back towards Honolulu, stopping in Kapolei to try a couple of easy summit there. The first was Puu Palailai on the north side of the highway that proved a little problematic. I knew it was private property but didn't realize it was an active ranch. There we cattle grazing behind a fence where I had planned to approach from a neighborhood street and decided to leave this for another time. I didn't think Mom would appreciate hearing about us dodging our way through the cattle. On the south side of the highway, part of Kapolei Regional Park, rises diminutive Puu Kapolei. I thought it would be a piece of cake but it turned out to be the toughest one today. We walked across the park from the point Google Maps had directed us to, about 1/3mi away, but there were much closer places to park just southwest of the highpoint. The trouble is there is a formidable fence topped by barbed wire surrounding the summit at its base, inside a rough, ungroomed mess of tall grass, some brush and loose lava rocks. We found a way inside where a dying tree had fallen across the fence, then made our way up a short but loose gravel/rock slope where we found a little-used dirt road. Jackie wanted to know why we didn't use the road. There were numbers located along the road which we later looked closely at to learn it was an archery range. Good thing no one was shooting at the moment. Continuing up cross-country, we reached a plateau where we had to wade through about 400ft of waist-high grass to reach the highpoint. There was a small concrete pad here, purpose unknown. Jackie was more interested in lunch at this point than hanging around, so we beat a retreat to the parking lot, finding a very good Thai restaurant nearby. After lunch we met up with the rest of the family back at Pearl Harbor, spending several hours there touring the museum and taking the boat ride out to the USS Arizona. There is much I could write about it and how it touched me deeply, but I'll leave it at - it was very good and I'd recommend anyone visiting Oahu to check it out. Afterwards, Jackie and I drove about 8mi southeast, to a neighborhood above Honolulu on Round Top Drive for a couple of short summits. The first, Round Top, is located in a state park just behind a state government telecom installation. The highpoint is found in a clump of trees with nothing much to say about it, other than it took not even 20ft of cross-country travel to reach it. Further along the grassy path we followed from the parking lot is the popular Tantalus Lookout, overlooking the metropolitan complex of Honolulu along the south shore. The more interesting summit was Puu Kakea about 0.6mi to the northeast. We got back in the Jeep and drove around the neighborhood looking for the easiest access before settling on a turnout along Round Top Dr just south of the summit. There is a TH for the Makiki Valley Trail that can be used to get a little closer on foot. The trail goes through a most interesting forest of trees that grow in all sorts of fantastic manners. We found the trail muddy but the cross-country, needed for the last 500ft, less so. We used trees as handholds to pull ourselves up the steep slopes and keep us from slipping on the wet ground. The summit had the remains of an old benchmark, the pole with metal fins having been broken off and the concrete base mostly busted up. No views here. We made our way down from the summit more directly to the TH, a less steep slope that took us down by more of these amazing trees. Jackie paused at several of the vine-like roots that drop from the branches to play Tarzan's Jane before eventually making our way back by 4:30p to end our day, a good one.